I am thrilled with today's project. Its a decent sized 4"x4"x1 1/2" inch fold flat box with clear heat embossed panels. I stamped the card stock twice using my new large Marbled background stamp in clear versamark, covered with clear Stampin' Emboss powder and set with my heat tool. 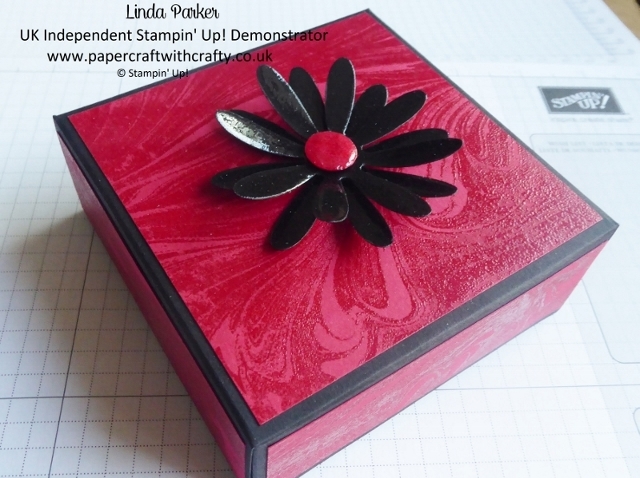 The two stamped images were then cut down into one 3 3/4" x 3 3/4" inch square piece and four 3 3/4" x 1 1/4" inch pieces to decorate my box. In my video I explain that you can make the beautiful flower topper using two different methods. One way is to use Versamark and clear Stampin' Emboss powder. However, I found that this method did not give me the super glossy shine I was after. The finish is a little on the dull side. So I chose to use my Rangers Glossy Accents. Now this method is slower as you do not have an instantaneous result. It takes approximately an hour for the punched flowers to dry completely before you can assemble your flower and adhere to your box. But I am a patient kind of girl and felt it worth the wait for such a stunning result. I think the flower looks enamelled and is very eyecatching. My latest video tutorial talks you through the whole process. Thanks for stopping by today - hope you enjoy the rest of the weekend. Right, that's another stamp on my list! Please stop posting beautiful projects, i'm running out of cash!